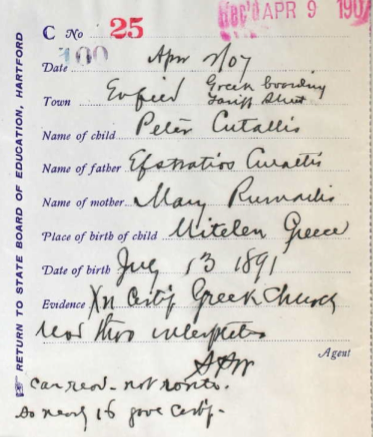 Ancestry.com has a database online that is titled - CONNECTICUT, SCHOOL AGE CERTIFICATES, 1904-1911 which includes 63 entries for children who listed Greece as their place of birth. These certificates vouched for your young ancestor’s right to work. As the twentieth century opened, the issue of child labor had risen to prominence in the labor movement. Thanks to reformers like Florence Kelley, Jane Addams, and Mother Jones, people were starting to take notice, and some states began regulating hours and conditions in which children could work. Connecticut started establishing educational requirements for working children in 1869. By 1882, working children between the ages of 8 and 14 were required to attend at least 12 weeks of school, and in 1895, children under the age of 14 were prohibited from working in “gainful employment” at all. In 1899, additional legislation gave teeth to the law by imposing a $20-per-week fine. To ensure compliance, employers had to keep proof of age for their child employees on file, but proof could be hard to come by, particularly in the cases of many young immigrants. What Are School Age Certificates?